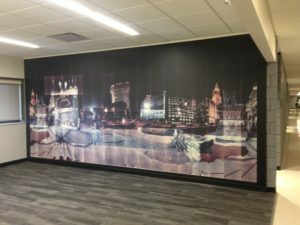 Newly installed mural size reproduction of “Public Square, Night” by Dr. Masumi Hayashi, at Cleveland State University, Main Classroom building, 4th floor. 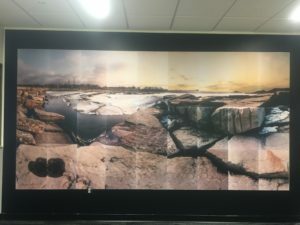 Dr. Masumi Hayashi’s “Edgewater Park”, mural-size reproduction in Main Classroom building of Cleveland State University. The Masumi Hayashi Foundation is proud to announce the successful installation of two mural-size reproductions of Dr. Hayashi’s work in the Main Classroom building of Cleveland State University, “Public Square, Night” and “Edgewater Park”! This project which has been in the works since 2016, is an exciting example of how Dr. Hayashi’s work can be magnified with epic results! Special thanks to collaborators, Melanie Boyd (Senior Architect, Cleveland State University), and Kathy Signorino (Artists Programs / Percent for Art Coordinator, Ohio Arts Council) for their work to make this happen! Special thanks to Margaret Coats, and Repros. Special thanks to Tom Huck and Trudy Wiesenberger at University Hospitals for making the physical work available for imaging, and providing attribution information about the piece. Thanks to Howard Agrieste, Chief Photographer at the Cleveland Museum of Art for photographing the work and producing the large digital files necessary for these wall size prints. And finally, the Foundation would like to thank Mike and Mary Gentile at M. Gentile Studios, for providing the transportation of the Public Square at Night piece, artwork, and making it possible to create digital files of the original artwork for this project and the book project!